Want to recapture your organization's original innovative spirit? 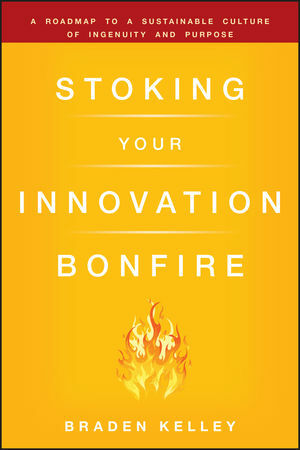 Stoking Your Innovation Bonfire helps you remove the obstacles that have crippled the innovation superpowers that made your organization successful in the first place. BRADEN KELLEY is the founder of Business Strategy Innovation and has been advising companies, including Microsoft, Misys, Millicom International Cellular, Wunder-man, and HomeAway.com on how to increase their revenue and cut their costs since 1996. Braden is a thought leader on the topic of continuous innovation and works with clients to create innovative strategies, effective customer marketing, organizational change, and improved organizational performance. He has published more than 400 articles for online publications such as CustomerThink and Blogging Innovation. On Twitter, he is an innovation leader with over 6,000 followers. About the Companion Web Site. Chapter 1 Blinded by the Light: Vision Blockages. Innovation Vision Example (Kuwait Petroleum Corporation). There Is No Single Innovation Vision. Innovation Vision Case Study—Ford Motor Company. Innovation Vision Case Study—Apple Computer. Innovation Vision Case Study—Walmart versus Amazon. Innovation Vision Case Study—Intel versus AMD, Qualcomm, and NVIDIA. Chapter 2 Peering in the Dark: Strategy Blockages. Strategy Must Be Based in Reality. Two Sources of Innovation, One Innovation Strategy. Time as a Component of Innovation Strategy. Innovation Strategy Case Study—The Whirlpool Example. Innovation Case Study—Open Innovation at Procter & Gamble. Chapter 3 Setting a Course Blindfolded: Goal Blockages. The Purpose of Innovation Goals. The Infl uence of Customer Permissions and Visual Frameworks on Your Innovation Strategy and Goals. PART II The Innovation Engine. Chapter 4 What Are They Really Thinking? : Insight Blockages. Broadcasting the Voice of the Customer. Trend Spotting, Behaviors, and Needs. Are You Innovating for the Past or the Future? Chapter 5 Shining a Light on the Customer Problem: Idea Generation Blockages. Chapter 6 Picking a Winner Without Looking: Idea Evaluation Blockages. Parallel Idea Evaluation in a Serial World. Saying No in the Right Way. The Importance of "Not Now". Chapter 7 Going to Market Blind: Idea Commercialization Blockages. Slow Innovation Case Study—The iPod. Slow Innovation Case Study—The VCR. Slow Innovation Case Study—The Internet. Slow Innovation Case Study—Southwest Airlines. Idea Commercialization Stories—Apple Designs a "No!" Chapter 8 Have You Had an Innovation Lobotomy? : Organizational Psychology Blockages. Breaking Out of the Mold. Choose Your Own Hours—A Case Study in Flexibility. Chapter 9 Do Your Policies and Processes Keep People in the Dark? : Information and Structural Blockages. Some Secrets of Continuous Innovation Are Nothing New. Should They Call Them Silos or Bunkers? Get Your Hands Off My Bonus. A Case Study in Breaking Down Information and Structural Barriers Cisco. Another Case Study—GE and Reverse Innovation. Chapter 10 Keeping the Lights On: Sustainability Blockages. If You Want Systemic Innovation, You Need Systems to Manage It. Managing Innovation Is About Managing Change—A Case Study. Blogging Innovation as a Case Study in Passion. Appendix B Visual Frameworks for Guiding Your Innovation Efforts. Appendix C The Innovation Baker's Dozen.